Desktops, laptops, tanktops, notebooks. Alienware have developed gaming-spec machines for – except tanktops obviously – pretty much all manner and shape of setup, recently cramming a high-performance PC into something about the size of a lunchbox with the X51. It’s in their very nature to consider what physical form a gaming PC can take, so the announcement of Microsoft’s Surface Pro, the Windows 8 powered tablet PC, should have pricked some ears at Alienware HQ, right? Right! In an Alienware interview with PCGamesN, product manager Eddy Goyanes gave us his thoughts on Surface Pro, as well as the potential for a Alienware gaming tablet. Spoiler: there’s just enough potential to warrant the mock-up you’re seeing right now. 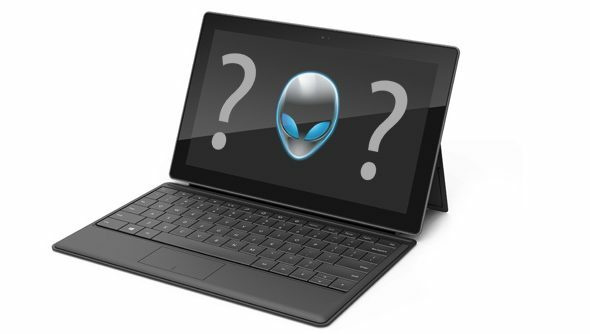 The Surface Pro might never match the punch of a desktop PC, but is there the potential for Alienware to develop their own power-focused tablet PC? If the X51 is being hailed as the “PC console”, could we have a “PC handheld”? “Right now we don’t have that in our sights, except we are constantly looking at what technology is out there in the marketplace,” explains Goyanes. “You know, with the M11X we started a new gaming space among notebooks, right? You never had that kind of gaming performance on an 11-inch notebook. With the X51 we’ve introduced an Alienware desktop that gives you a certain level of immersion that we didn’t have before with this size and this price of desktop. You can read the fullAlienware interviewwith Eddy Goyanes here.